Barely a day after President Micheal Sata delivered a speech at State House urging the factions in his party to ceasefire, the feud has escalated especially in Lusaka where the pro-Sata group has deployed youths armed with all manner of offensive weapons at the party secretariat for an imminent clash today with the deposed pro-Kabimba appointees who according to reports have been instructed by Vice-President Guy Scott to retake the party’s Lusaka offices at all costs. President Sata’s ‘compromise’ speech delivered at the swearing-in ceremony of Mumbi Phiri as Tanzania ambassador has merely incensed the youths who now say the President’s failure to speak strongly against the pro-Kabimba group has left them with only their ‘initiative’ to defend their holding of party offices. The President, against high anticipation from his supporters that he would crack the whip on the pro-Kabimba group, merely asked the camps to stop forming parallel structures. “We know of the plans by the Scott-led faction that wants to impose the former district leadership back into office when the President has already recognised Chikwelete as the district chairperson. It seems the Vice-President has a different agenda from his boss,” they said. They charged that squabbles in the ruling party would not stop as long as the President did not come out strong on disciplining secretary general Wynter Kabimba, and his faction because lack of action was confusing the young people in the party. And the party officials have challenged President Sata to clearly state his position on the continued wrangles that have rocked the party for almost two months now. The PF officials including Cabinet ministers are demanding to know the contents of the alleged Sata-Kabimba succession pact being led by the cartel that has allegedly blackmailed President Sata with a newspaper blackout and negative publicity should he crack the whip on his embattled justice minister. They said it was sad that the pro-Kabimba camp had succeeded in blackmailing the head of state as planned and this had made it difficult for him to decide on the matter. They wondered why the President decided to read from a written speech instead of him stating his mind on the matter. “It is true the head of state is being held hostage and cannot make a decision on this matter. His statement was a clear indication that he had failed to provide leadership and as a party we are wondering who wrote the speech for the President. As a leader he was expected to make a decision whether right or wrong but he decided to create more confusion and suspense,” the officials said. They stated that the event of Tuesday at State House where Sata was forced to read a prepared speech to discuss the crisis in the party had confirmed fears that the President was not in-charge of governing the country. The officials said Sata had been blackmailed by a known group and that most of the decision he had announced had not been made by him. “The deep succession wrangles that have engulfed the ruling party are well known even by primary school pupils and we wonder why our President was restricted to reading a speech in an attempt to talk about this instead of stating his position as party leader,” they said. 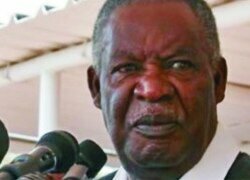 The senior party members were worried that the ruling PF would only serve a term or less in government if the alleged succession between Republican President Michael Sata and his party secretary general Wynter Kabimba was going to be allowed. The members said they were dismayed by President Sata’s failure to meet the expectations of the majority of senior party members who have made it clear that they did not want to work with Kabimba because of his bad attitude towards other members of the party. It is also alleged that the embattled PF secretary general Wynter Kabimba had allegedly formed parallel structures within the ruling party which he was planning to use in strengthening an already established and strong opposition political party. The officials also alleged that Kabimba had become untouchable because he (Kabimba) together with President Sata had allegedly abused the Road Development Agency (RDA) and that most of the contracts were awarded to friends and relatives of the President and his secretary general. They said the meetings that took place along Independence Avenue had been systematically planned on how to blackmail the President as they realised that the succession pact that was signed with President Sata was not going to succeed. It is now very clear that the President is under siege. Both parties know a lot and are prepared for a “photo finish”. Let’s wait for the explosion. Believe me Plot 1is EMPTY!